The Tactical Ground Reporting System combines a database of information about the Iraq war and maps that allows junior officers to both study the terrain in light of past incidents, and share information about conditions on the ground. Troops were shown a prototype by DARPA in late 2006, and the current version was introduced in 2007. 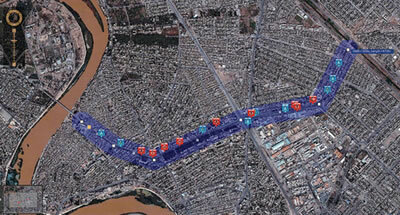 Purple line shows a possible Baghdad patrol route. Past events in a 300-meter buffer are noted. Hostile actions, such as IED attacks or shootings, appear as various red icons; friendly actions, such as visits to schools, appear as blue icons. Clicking the icons brings up text, photos, even videos. Once the map-based application is up, users can click on icons and lists, see the locations of key buildings (like mosques) and retrieve information about past attacks. They can also bring up geotagged digital photographs of buildings taken with GPS locations built-in, as well as pictures of suspected insurgents. According to troops in Iraq, the environment is very "granular," that is, religious, ethnic and political minorities may hold sway in areas as small as a neighborhood or city block. "One of the very first things we did in looking at the IED problem was to recognize that the army is trying to fight an insurgency with a pretty blunt instrument," Perry says. "This is about 90 percent police work and 10 percent violent conflicts. Patrols--the cop on a beat--fill out a report saying, Here is what I did. You get situational awareness." Charles Stross wrote about a very similar application for police called CopSpace.